Mouthparts: Mandible triangular, with 5 or 6 teeth (rarely 7). Thorax: In dorsal view, mesonotum severely constricted giving the mesosoma a distinctive hourglass-like shape; dorsal surface of mesosoma smooth and very shiny. Queen: 8 mm. Worker: 2.5-3.5 mm. Male: 3-4 mm. Workers feed on honeydew, secretions of floral and extrafloral nectaries, sap flows, exudates from galls, earthworms and arthropods (usually as carrion), and ripened or decaying fruit. Usually nest in the soil with some clay content (but variety testacea lives in sand) in wooded situations or occasionally constructing a chamber under a rock or log. 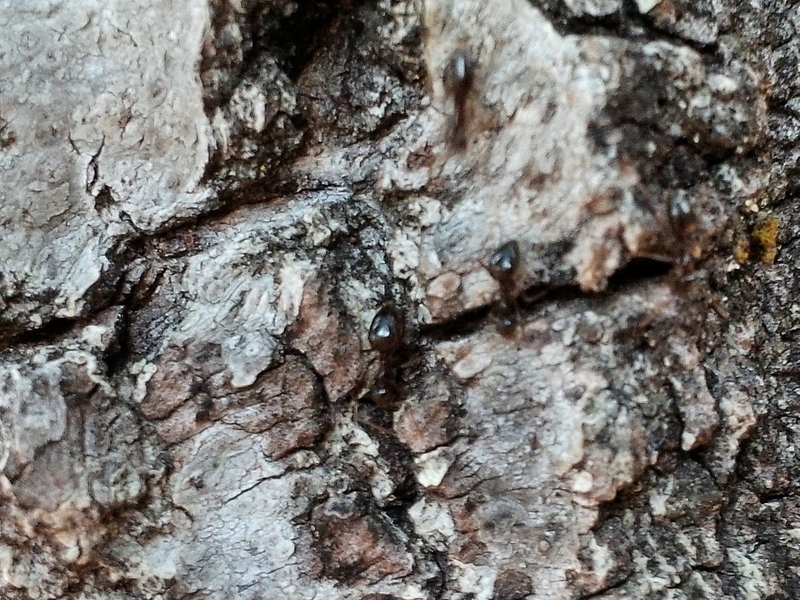 This ant is often associated with oak woodlands of various sorts (or scrub oak thickets in the west), but also (beech-)maple. This ant can be a pest in Bay Area homes. Most of the United States, plus southern Ontario and Mexico. Year round. P. imparis is unusual in its ability to get around when temperatures are just a few degrees above freezing. Nests are often deep underground. Colonies may be inactive during the summer months, becoming more active when the weather cools. This is the earliest flying of our cool climate North American ants. Males and females are reared in late summer, overwintering underground. Young workers are "overfed" and swell with fat, from which a nutritious glandular secretion is produced that is the main food upon which the year's single brood of workers and alates is reared. After this corpulent stage, the storage workers lose weight and sclerotize to become the forager (temporal) caste. Species Prenolepis imparis - False Honey Ant. (bugguide.net/node/view/27323). Accessed June 1, 2017. .